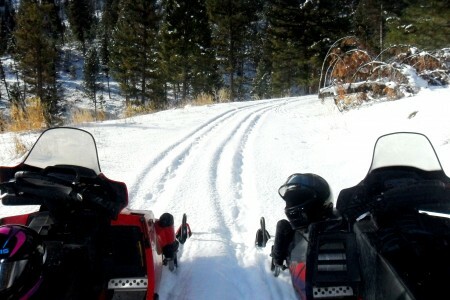 Seeley Lake, Montana– For public safety while log hauling is ongoing for a Department of Natural Resources and Conservation (DNRC) timber sale, the Seeley Lake Ranger District has closed snowmobile Trail Number SNO-63.31 to snowmobile use. This trail is also known as the Spring Creek Road (#46942). The log hauling is associated with the DNRC Clear East Timber Sale in the Horseshoe West area. The closure is in place from Mile Post 0 (junction with Highway 83) to Mile Post 3.1 from the hours of 4 a.m. to 6 p.m. Monday-Friday. The snowmobile trail is open and available for use outside of the hours listed above, on the weekends and holidays (December 25, January 1, January 15, February 19). The closure will remain in place until the work is completed. As a reminder current closures on snowmobile trails SNO-63.01 (Cottonwood Lakes) and SNO-63.13 (Kozy Korner) will OPEN Saturday, December 16. Forest Service log hauling operations will move over to the Monture/Dunham area. The main Monture Road will be plowed to Dunhman Creek. Mixed use traffic (snowmobile and log hauling) will also continue to this location. All other wheeled vehicle traffic will be restricted as signed. Log hauling will be restricted to the hours of 4 a.m. to 6 p.m. Monday-Friday. No log hauling will occur on weekends or holidays (December 25, January 1, January 15, February 19). For details on all snowmobile trail closures and alternative snowmobile trail access, please contact the Seeley Lake Ranger District at 406 677-2233.